CPE Bach, born in Weimar in 1714, was the second son of Johann Sebastian and Maria Barbara. Having studied law at the universities of Leipzig and Frankfurt, he entered the service of Crown Prince Frederick of Prussia in 1738. When the latter ascended the throne in 1740, Bach was appointed Court Chamber Harpsichordist in Potsdam. In 1768 he suceeded Georg Philipp Telemann as Director of Music in Hamburg, where he lived until his death in 1788. 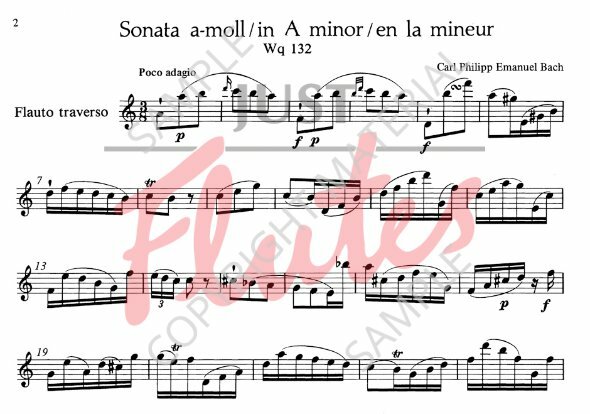 The Sonata in A minor for solo flute was composed in Berlin in 1747, belonging to a period during which Bach wrote or revised a relatively large amount of chamber music with flute. These works include the trio sonatas for flute, violin and bass and the soli for flute and bass, all of which likewise date from 1747. Very probably all these works were composed for Bach's employer, Frederick the Great, or for the latter's flute teacher JJ Quantz. Like his father, CPE Bach wrote his only composition for solo flute without bass in the key of A Minor. This key did not confront the flautist of the time with particular difficulties, but it was a somewhat unwonted key for the flute. Both compositions make similarly severe demands on the player's technical and musical capablities, not least by virtue of the large intervals (perfect 15ths and diminished 14ths) and chromatic writing, which also occurs in the upper register. While this aspect may be seen as a kind of homage to his father (whom CPE Bach revered all his life as a teacher), the lay-out and structure of the younger man's composition are in almost diametrical contrast to that of his father. Some of the factors which brought about this radical change in style are outlined below. It was during his period in Berlin that CPE Bach was exposed to the pervasive influence of the most recent aesthetic thinking of his day, which had first been formulated in France and subsequently evolved further at the Potsdam court, which was strongly oriented towards French taste. The central feature of the new aesthetic was the older tenet of the 'imitation of Nature'. This principle was now applied to the entire spectrum of art, within which music was newly defined and systematised as the 'language of emotions'. Having been schooled by his father, CPE Bach himself made a decisive contribution to this new musical aesthetic in that he also incorporated instrumental music independent of any textual or programmatic basis in his rhetorical style. He even went so far as to imitate with musical means the physical characterisics of speech such as the enlargement of the vocal compass or the patterns of slow, rapid and excited speech. The sonata for solo flute is a perfect example of the composer's use of a speech-oriented, declamatory style, particularly in the opening movement, the "Poco Adagio". 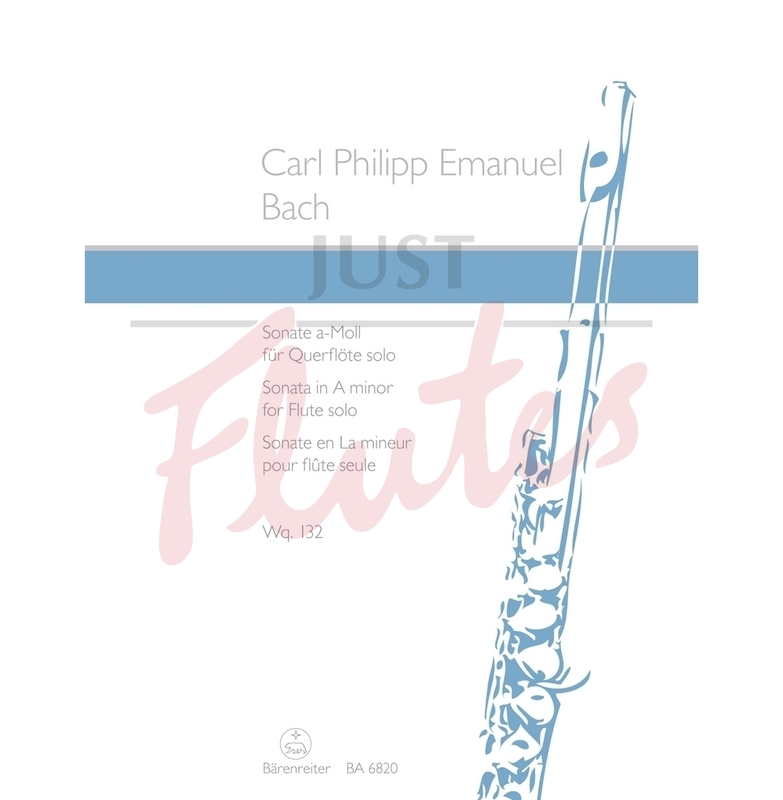 The work also explores new areas of the flute's technical repertoire. Bach makes use of rapid changes of register, dynamic contrasts linked with tone colour and combined with so-called Mannheim suspensions and extreme leaps. The two allegro movements are motivic developments of the material of the opening movement and are in the same key. The element of 'diversion' for the flautist is found in the arpeggios and brilliant scalic passages. The tenuto writing in the second movement is a characterisitc feature of the work. Contemporaries of the day that heard Bach perform observed that he conceivably had the tonal qualities of the clavichord - his favourite instrument - in mind when he composed the present work, particularly in terms of the subtle tonal and dynamic shading and the intricate embellishments. In the matter of phrasing and articulation, the ties and other phrase marks which CPE Bach himself stipulated in this sonata are not typical of the practice of his time. For instance, slurs over wide leaps and furthermore over a whole bar or even two bars, over spread triads and against the beat were not customary in the context of contemporary performance practice. The contrast in registers which such devices achieve is reinforced by the inclusion of dynamics, giving rise to consistent partwriting. In the context of its own time, this sonata was quite literally an experimental composition, and still today we find studying the work a rewarding undertaking.